Julius is a young doctor in New York City, completing his residency in psychiatry. He begins a routine of walking through the city each day after his shift is over. During these walks, he runs into old friends, meets new acquaintances, thinks about his life so far, and wonders about the ways in which we are both connected to each other and utterly alone. From the first sentence, you can tell that Teju Cole's writing style is a bit different. The first sentence reads "And so when I began to go on evening walks last fall, I found Morningside Heights an easy place from which to set out into the city." This is a story starting in the middle. Although all stories start (and end) in the middle of someone's life, I was intrigued by Cole's decision to bring attention to it. This is not a plot-heavy novel. Julius wanders through his thoughts at the same speed that he meanders through the streets of NYC. So it may not be the book for you if you like a story that will keep you on the edge of your seat. 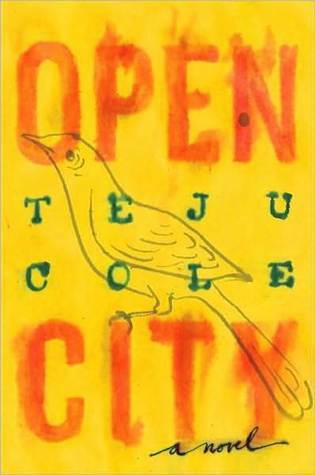 But there are many other reasons to read Open City - this book is like a walking tour through the city complete with lessons in music, history, and art alongside insightful observations about life and community. "And, before that? What Lenape paths lay buried beneath the rubble? The site was a palimpsest, as was all the city, written, erased, rewritten. There had been communities here before Columbus ever set sail, before Verrazano anchored his ships in the narrows, or the black Portuguese slave trader Esteban Gomez sailed up the Hudson; human beings had lived here, built homes, and quarreled with their neighbors long before the Dutch ever saw a business opportunity in the rich furs and timber of the island and its calm bay. Generations rushed through the eyes of the needle, and I, one of the still legible crowd, entered the subway. I wanted to find the line that connected me to my own part in these stories." Julius has no familial ties in America, as he emigrated from Nigeria. He spends a great deal of the novel thinking about connections and the way it is easy to strike up a conversation with someone he has never met while realizing that he hardly knows the people he would call his friends and mentors. Early in the book, he runs into his next-door neighbor and is shocked to find that his neighbor's wife had died several months ago. "A woman had died in the room next to mine, she had died on the other side of the wall I was leaning against, and I had known nothing of it....That was the worst of it. I had noticed neither her absence nor the change - there must have been a change - in his spirit. It was not possible, even then, to go knock on his door and embrace him, or to speak with him at length. It would have been false intimacy." It can be hard at times to really connect to our narrator. Perhaps this is because he has so few attachments and so we view him through his thoughts on things instead of people. There is a moment in the story where something is revealed about his past that threatens to unravel any perception the reader has of him. Instead of confirming or denying this, the author and Julius himself just leave it alone. In addition, the ending is abrupt. This book just seems to end in the middle of a thought. But I suppose it all relates back to the idea of any story just being a snippet of a life. Open City is a really interesting read. While it doesn't have a breakneck plot or really developed characters, it does ask a lot of important questions about how well we can know other people in our community and how much we reveal of ourselves to others. If you don't mind a slower, thoughtful read, I would recommend that you pick up this PEN/Hemingway Award winner. This was one of the finest books I read in 2011. Really, really admired it and it was the one book I'd read that I predicted would end up on the award circuit. It's very different from most books but if you can get past that, it's a really fascinating read.